A fire official inspected the burned-out residence at 410 Nahua St.
Waikiki resident Sarah Pollock credited two alert Honolulu police officers with saving her life yesterday when they woke up her and her neighbors to tell them their building was on fire. Pollock, who lives on the second floor of the four-story Hawaiian Prince at 410 Nahua St., said she was awakened shortly after 6:30 yesterday morning when "someone was banging on my door." "I was half asleep when the police started knocking on my door," said Pollock, who has lived in the apartment complex for the past four years. "I am really lucky. I think those policemen saved my life." Honolulu police officer Michael Choy and his trainee, officer Raynette Ho, were on early morning patrol when Ho spotted the smoke coming out of the louvers of a second-floor apartment. Choy, a six-year veteran of the police force, said he had to kick down the door to Apartment 202 since no one answered. "I was hit by a thick wall of smoke. I had to go lower and then I saw the blaze on the south wall of the apartment," he said. "Visibility was like only a foot." No one was home in the studio apartment adjacent to Pollock's. Capt. Kenison Tejada, Honolulu Fire Department spokesman, said an 82-year-old woman from a third apartment was taken to Straub Clinic & Hospital with respiratory problems and was listed in serious condition. Choy said after he called in the alarm he was joined by six more police officers who helped evacuate the building. He said that within five minutes about a dozen Waikiki firefighters and five trucks responded to the two-alarm fire. Tejada said the fire was under control by 6:57 a.m. He said the studio apartment was "completely gutted." Also damaged was the apartment one floor above the studio. It was also empty at the time of the blaze. 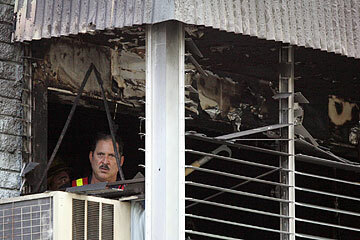 There was no immediate estimate of damage or what started the fire, Tejada added. About 72 people live in the 52 apartment units. Bob Kessler, another resident of the building, also credited the quick action by the police department.